If you have not ventured over to the newly launched '78Topps (here), you are missing out on some serious fun and nostalgia (not to mention a chance to win/earn free cards!). 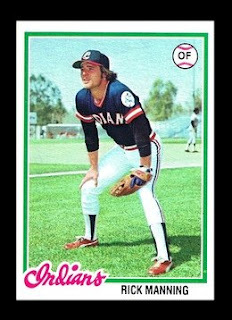 The cards are being presented in numerical order, and the first Indians player to make an appearance is card number 11, Rick Manning. Manning wore Number 28 in 1978, in 1981 he switched to Number 20. That explains why we haven't seen him yet in the All-Time Indians by Uniform Number (not to mention that I am WAY behind on that). In '78, he had 149 hits in 566 at-bats. He scored 65 runs, 27 doubles, 3 triples and 3 homers, netting 50 RBIs. He struck out 62 times, ending the season with a .263 average. In the field, he had 377 put outs in 386 chances, 7 assists and only 2 errors, netting him a .995 fielding percentage. Rick Manning is a Niagara Falls native. When they brought a minor league team to N.F., Manning was there on the first day. He was treated as a king! Seemed like a pleasant guy.